Rachel Von | The Journal Gazette Carroll's David Ejah dunks the ball as Northrop's TaQuay White looks on during the third quarter of Friday night's SAC game at Northrop. Rachel Von | The Journal Gazette Carroll’s Cody Burkey gets past Northrop’s TaQuay White to get to the basket during the third quarter Friday night at Northrop. Carroll wasn't going to give up its SAC regular season title that easy. Heading into enemy territory where a loss would give Northrop (12-5, 7-1 SAC) the outright title, the Chargers (13-4, 7-1) were hungry for an opportunity to face the first-place Bruins. And they didn't take it lightly. In fact, they made a statement. 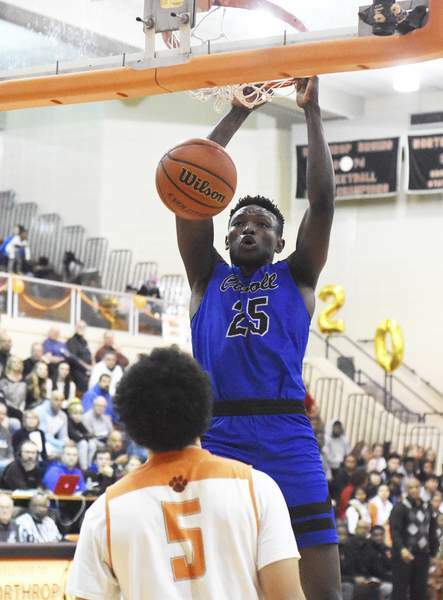 Dan McKeeman scored 25 points and David Ejah's 16 points and 18 rebounds led to a 63-50 win over Northrop on Friday night. 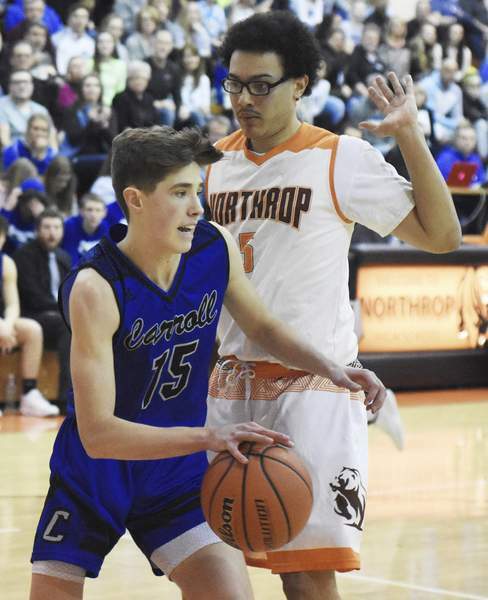 After Northrop's Sydney Curry opened the game with an easy shot in the paint, it looked as though one of the area's top scorers and rebounders was headed for a monster night. Curry met his match, though, with the Chargers' Preston Shearer and Ejah, who held him to 11 points and 15 rebounds. “You put length behind Preston, who's very feisty and strong, and then when you get David there who's athletic and can block some shots, it worked out for us tonight,” Carroll coach Marty Beasley said. McKeeman heated up 90 seconds into the second quarter, drilling a 3-pointer to get the Chargers rolling. The senior sharpshooter reeled in an offensive rebound and finished the put-back on the next Carroll possession. Carroll used a 10-0 run in the second quarter to go up 17-9 with 3:03 to play in the first half. “It felt great to get some shots to go down, but my teammates were finding me in great spots and setting great screens for me,” McKeeman said. Carroll's four-point halftime lead quickly grew. Ejah grabbed an offensive rebound and took it the length of the floor to finish and was fouled. McKeeman, who had 14 of his 25 in the third quarter, followed it up with a 3-pointer to make it 24-15. Ejah and Curry, two of the area's best big men, battled all night. In a wild sequence with the Bruins' student section chirping at Ejah, the Carroll senior had two monster blocks on back-to-back possessions and a two-handed slam to top it off. That put the Chargers up 32-23 with 3:07 left in the third quarter. The Bruins didn't go away. Curry bullied his way to the basket and was fouled. He missed the free throw, but Qualen Pettus was there for the put-back to pull within five with 90 seconds left. They got no closer, and the Chargers have now won 12 of their last 13.